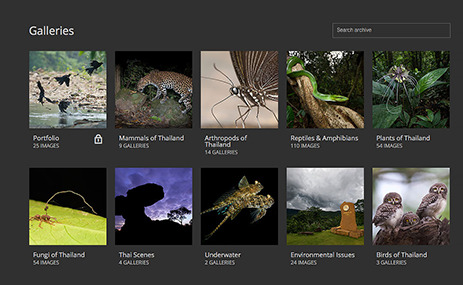 The “Thailand Wildlife Collection” is a personal conservation photography endeavor by four photographers, to assist in facilitating communication and public awareness through wildlife imagery. Its aims are to make free quality wildlife images available to those helping to support Thailand’s incredible bio-diversity. Whether it’s for outreach, conservation reports, flyers, articles, books, exhibitions, websites or presentations – great wildlife images are a key element in any conservation minded organisation’s communications effort. World class research and campaigning deserves world class visual support and the photographers of “Thailand Wildlife” have consolidated their extensive personal photographic archives in order to provide an open resource to help support conservation efforts in Thailand. The DNP, Government agencies, institutions, international organisations, and wildlife NGOs can access and use our entire collection of imagery. There are no charges whatsoever, ThailandWildlife.com is a personal pro bono undertaking by its photographers to support Thailand on a personal level. WHAT YOU WILL FIND ON THE SITE …..
Visit our Conservation Archive – probably the largest online collection of quality Thai wildlife images on the net. The archive contains over 5000 quality images that meet the highest technical standards. All brought together to support conservation awareness initiatives of Thai conservationists and organizations. All of our images are of animals and scenes shot in the wild in their natural environment in Thailand. Or view our “online exhibition” galleries. These galleries bring you the best of our photography in one location for your enjoyment. The galleries are sorted by the major subject areas of the collective’s contributing photographers. You can view the photographs displaying various aspects of birds, mammals, amphibians, reptiles, bio-diversity, insects, and Thai forests. Showcasing Thailand’s best wildlife and nature experiences.